The Starter Shop Box is a new addition to our range. The shop box is available as a flat pack kit. 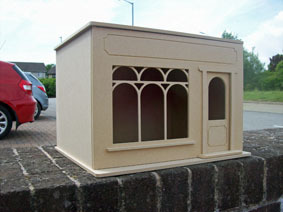 The shop is constructed using 6 mm MDF. No fiddling with hinges as the main front and shop door just slot into place. The main shop window and shop door may be glazed at your discretion. All panels are grooved and or rebated using our state of the art computer controlled CNC machinery.